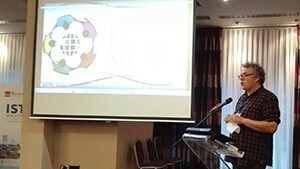 Matti speaking about The Peace Fields Project at a conference in Zagreb, Croatia. The Peace Village are the custodians of one of the world’s most poignant football pitch. To play a game of football at Flanders Fields is more than a game. The whole experience contextualizes football way beyond the modern game’ Flanders Peace Pitch is the most level playing field you will every play on’, says, Matti Vandemeale, Director of The Peace Village’. The Peace Village celebrated its 10th birthday this year. Can you summarise what have been the highlights in the last 10 years? The first thing that was important was that we had to fill the ‘hostel’ with people coming over. Now we reach 20,000 people a year who come to visit the battlefields from across the world. Second thing we achieved was to create meaningful and interesting peace projects for our guests. We try to offer young and old visitors, projects, ceremonies, workshops and sports activities – including football, to help them making ‘peace’ more concrete. I am glad we reached the point of being more than just the best bed and breakfast in the region. We are also an active actor in making peace events and guiding people in the region. I’m also proud that we could translate the story of the Christmas truces into concrete projects e.g. the Global Peace Games, The Peace Field Project and International Day of Peace with the NCFA and partners. What is the best part about your job and why? The best part is for me when we can ‘help’ one of the young people visiting the region in giving him / her an experience with a lifelong memory of their visit. Sometimes we have ‘challenging’ groups of young and older people who may have special needs or come from difficult backgrounds and when we engage them in history, they contextualise their home lives with the incredible stories of the First World War, especially The Christmas Truces. The Peace Village receives over 20,000 guests a year. What memories do you think they take back home and what kind of messages do they leave in the visitor’s book? Mostly get positive feedback. We try to do our best in giving them the things they need and even more. The memories they take home are usually from the tour they did in the region. They general connect with the awesome amount of facts, stats and names, of soldiers that came from around the world to fight in The First World War can have a positive impact. We bespoke our programmes to meet the needs of many different communities and cultures. Things that may work for one person / group doesn’t necessarily work for another person / group. It’s the tour guiding in the region that makes us special. It is the excellent facilities that provide a relaxing trip. So, when they go home with a good feeling we here at The Peace Village are happy too. The Peace Village and The NCFA continue to inspire young peacemakers for the future through the Peace Fields Projects, Global Peace Games and International Day of Peace. How difficult is it to generate funding for these projects and why is finding funding so difficult? I believe in the kind of projects that we do with the NCFA. They are unique in terms of formal and informal learning. The problem is that we must conform to a tick box culture. Funding streams are regimental they are very difficult to adapt to with what we do here and funding streams do not consider the long-term sustainability of any one project in terms of development. They tend to be focused on a current elective government policy which hinders and sense of unity. The projects we achieve with The NCFA are cross-curricular based, they engage young people in football, sports and sportsmanship. In addition, the projects involve history, art, languages, citizenship, conflict resolution and debates on peace. Funders tend to be more myopic focused on individual projects. Our projects are a combination of elements, which can be viewed currently as a weakness rather than funders sharing the vision as a strength. What would you like to see The Peace Village achieve in the next 10 years? I hope we can reach more people with the educational and project work we are doing, I hope our collaboration in football and sports with the NCFA continues to make peace makers for the future and that we can find funding to work on a permanent base without everyday funding concerns. I hope we can play an active role in peace building across the world. So, projects where we make the link between WWI and conflicts and working with young people in solving these conflicts of today.